I land in Johannesburg for the third time in four years. I drive into the city guided by faint memory and intuition. I drive carefully but still I end up taking a wrong turn and land in the middle of town, on Main Street. Two things then seem clear: The first – there aren’t any white people on the streets. However, this is inaccurate; I look harder and find a single, tall white man exiting a mechanic’s shop. He has dropped off his Audi and is walking across the street towards a coffee shop. 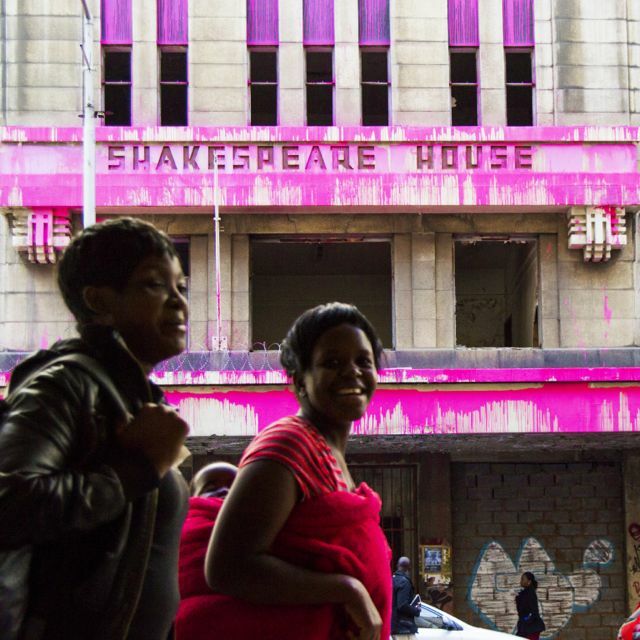 Though the abolishment of apartheid happened 20 years ago, downtown Johannesburg’s colour palette has changed, but not in the way one would have predicted. The second: There is a plethora of big, fat, abandoned buildings, ten stories and higher, each of them marked by broken windows, barred doors, and bricked up floors. They are beautiful, hallowed objects left behind by time and a history long forgotten. From art deco to modernist and post-modernist architectural treasures, they are spread out sporadically from block to block, colour-less. Witnessing these human structures, one is reminded of post-apocalyptic, dystopian worlds popular in science fiction films and literature. Yet this is our world today, one in which thousands of people, most of them black citizens from all over Africa, live on the streets surrounded by squalor, in a city famous for its gold and diamond trade. Many of these individuals who migrate south hope to escape the hostility of war torn countries and encounter instead, a different type of war zone in Johannesburg. Fascinated by how the city seems to have abandoned these buildings just like it has some of its population, I can not imagine that, almost six weeks later, I would find myself transported from the roof of one of these dilapidated buildings to a jail cell in Johannesburg’s central police station. The jail cell – with its many barred, fenced, and frosted glass windows–made me feel helpless. By contrast, the abandoned buildings – where most windows are broken or missing altogether-made my team and I feel an empowerment and awareness that vibrated with possibility. Consider windowless buildings. Bleeding and gutted buildings. Consider a system in which government and privately owned buildings are left uncared for from block to block throughout the heart of a city. If the broken windows theory prescribes a zero tolerance policy for even minor damage to property, how can entire structures be abandoned, left to rot, without devastating effects on those who can not afford to move to other neighborhoods? It was back in 1982 that the broken window theory was first introduced by social scientists Wilson & Kelling. They asked their audience to consider a building with a few broken windows. If the windows were not repaired, vandals would likely break a few more windows. Eventually, they may even break into the building, and – if it was unoccupied – perhaps become squatters or light fires inside. Chapter two, section 26 of the Constitution of South Africa states that “Everyone has the right to have access to adequate housing.” With so many evictions happening due to Mayor Park Tau’s “Operation Clean Sweep” and with thousands of people in the inner city with no place to live, how can we go on ignoring all of these buildings that could be renovated as potential homes? “Demolition by decay” – as it is referred to in the blogosphere – still plagues the city centre today. The wickedness of some owners is only matched by the sheer indifference of the municipality, taking no action, even when owed millions of rand in rates. As I keep thinking of these still beautiful buildings, I speak to friends of mine, local artists, about turning them into “Living Sculptures” so that the people of Johannesburg are reminded of their presence and the injustice they embody.Maybe we could highlight the buildings? Maybe we could paint them hot-pink? 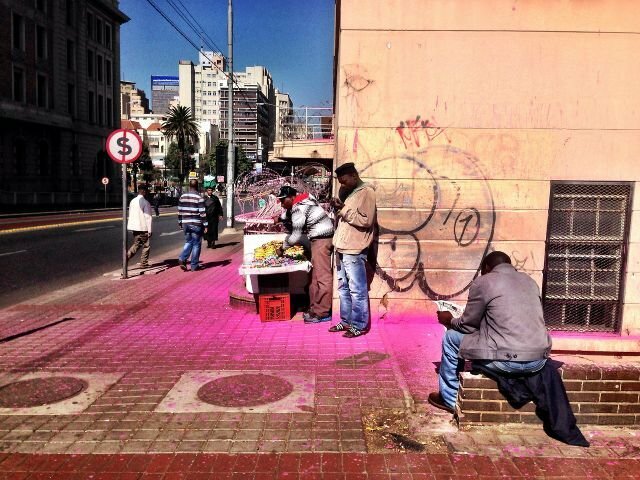 From what I had observed in Jozi’s urban environment, there is not much of that colour anywhere… no South African brands seemed to use this colour and therefore it would be easy to create new associations in Johannesburg’s cultural landscape. The artists, and most people who learned about the project in the following weeks, were excited about the idea and “valued the style, urgency, underground stealth, surprise approach and the overall intention” of the project. It is not until later, amongst painters, photographers, and print-makers that we decide on the style of painting: we will pour the paint from the top of the chosen dilapidated building first. Then we will go down floor by floor and collectively decide which windows will “bleed out.” We are excited by the notion that the buildings would appear to be crying, bleeding, leaking colour. The colour and medium of choice will take the form of more than 1000 litres of hot-pink, water-soluble paint. Once the idea is solidified, we spread the word over a period of three weeks. More than thirty local creative agents of all colours and creeds join our nightly excursions to help paint and document our process. Friends invite friends. All show up after midnight wearing their old clothes, their curiosity, and their courage. We start in the last week of June and finish in the first week of August. We study the buildings during the daytime: we draw up floor plans, circulation patterns, and check the finishes on floors and walls – mostly scattered debris. Then, at the agreed-upon early morning hour, we gather and travel downtown with our buckets of paint and our ladders. The big challenge with most of our buildings is gaining entry to the second floor – once inside, we usually have access to the rest of the building. We walk up to the roof, and prepare our tools, pouring the pink paint slowly and evenly from top to bottom. As much work as could be done in preparation, we never have control over how the paint will actually adhere to each building. The speed and texture always varies, and it is always exciting to gaze upon the end result the following morning. It is not until we have found a comfortable pattern, meeting and working together while most of the city is asleep, that the head of security of our seventh highlighted building approaches us and calls the police. He wants to know what we are doing and why were doing it. 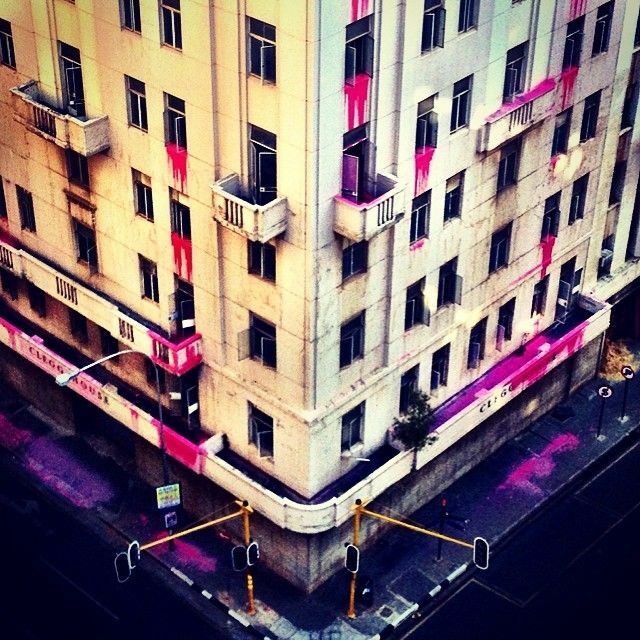 From our pink stained attire, everyone could easily assume that we are responsible for the buildings that have been dressed in pink in the previous weeks. As the leader of this project, I feel it is my duty to take care of whatever charges may come up and asked my fellow artists and activists to leave the scene. The police ask me to follow them to the station, along with the security guard, to talk to the colonel. Once there, I realise that I have no phone, no identification, and no way out. At first, he claims that he could not let me go because I have no way to identify myself. Sometime after three in the morning they find a case number for a “malicious destruction of property” that had been pressed the previous week for one of our transformed buildings. With the case in hand, I am booked into Johannesburg’s central police station as a suspect. Feeling completely isolated and alone, one question comes to my mind: “what is more unjust: to allow buildings to decay and create an atmosphere that permeates of fear, or to use colour to create a conversation about how we can all be a part of bringing said buildings back to life?” And also, aren’t these buildings, a vital part of the fabric of the city of Johannesburg, all of our responsibility? Some parts of the prison feel as neglected and dilapidated as the buildings that I have been studying for weeks. Buildings like the CNA, Shakespeare House and New Kempsey – a full city block of historical Art Deco buildings, bricked up and left to crumble as rain pelts through the broken windows – are not that different from this local police station, and its inhabitants are often the very same hopeless people who sit and walk around the city’s Central Business District. Painting is a way for us to challenge our colour-blindness to these issues. 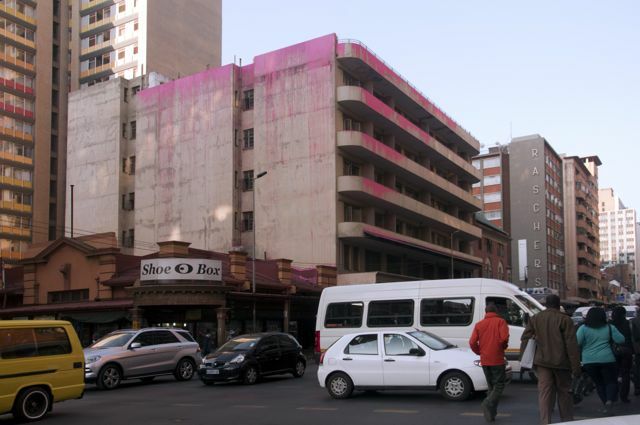 By highlighting these facades in pink, we have generated important dialogue and debate among the denizens of Johannesburg. We hope that these conversations will in turn, be a call to action. The project we started is ongoing and more buildings will be painted soon. Just like some of the legacy of apartheid, these buildings may be abandoned, but they are still standing. Now more than ever we are responsible for being aware of colour – whether it be in the black and white of race, or the pink of social injustice. Yazmany Arboleda is a New York-based Colombian-American artist who lectures internationally on the power of art in public space. He is the Creative Director of MIT’s ENGAGE program as well as The Brooklyn Cottage. His work has been written about in the New York Times, Washington Post, UK’s Guardian, Fast Company, and Reuters. In 2013, he was named one of Good Magazine’s 100 People Making Our World Better. The work of South African costumer and puppet maker Macdonald Mfolo caught our eye after a recent interview with Another Africa highlighted the large scale puppets he created as part of the collaborative fashion and photography exhibition NOT x Chris Saunders. The cross-cultural project fuses the work of South African artisans and designers together with that of Jenny Lai, a New York-based experimental womenswear designer, and Chris Saunders, a photojournalist living and working in Johannesburg. The exhibition puts a spotlight on the social and cultural climates that creatives from New York and South Africa find themselves inhabiting while showcasing the viability of global collaborations in this digital age. Mfolo, who is based in the Orange Farm township and picked up his puppet-making skills a few years ago as part of the production crew on the Pale Ya Rona Carnival, primarily works as a costume designer for the Pantsula dance group Real Action Pantsula. His full-bodied puppets are put together using papier-mâché and re-purposed materials such as discarded cement bags salvaged from construction sites and plastic bottles from a nearby recycling depot. 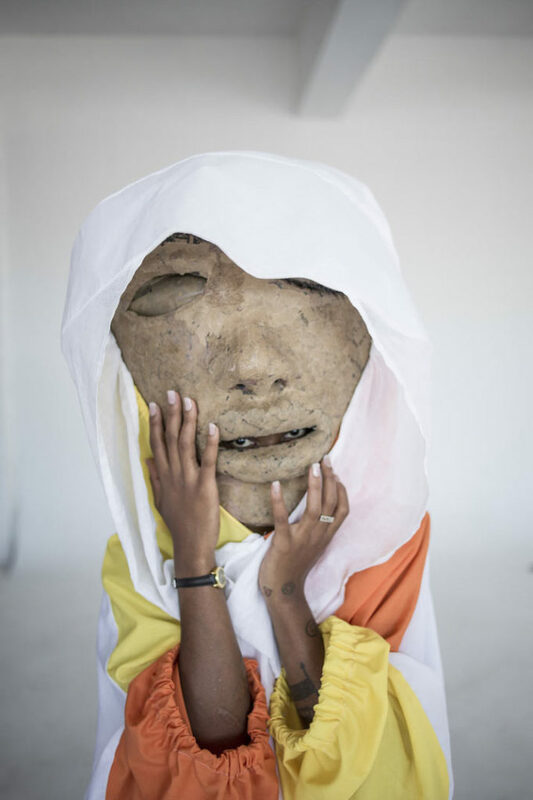 Mfolo’s collaboration with Lai takes the vibrant Pantsula aesthetic and blends it with Lai’s avant-garde apparel for a surreal visual experience captured through Saunders’ lens and channeled through the movements of South African performance artist Manthe Ribane, who wears the puppet suits. Though his puppet-making work currently exists only within the sphere of performance, Mfolo’s goals are and always have been community-oriented. “I want to create a skills college,” he told Another Africa. “I think skills development needs to be more emphasised in South Africa. We export a lot of things instead of creating them here.” In 2005, he established Farmland Production, a free workshop-based initiative that aims to empower local women and youth by teaching basic sewing skills that would help the community to become more self-sufficient. In addition to this, Mfolo’s organisation produces uniforms for local schools, and spearheads talent showcases and dance competitions. Read the full interview to learn more about the emerging designer. NOT x Chris Saunders will be on display at Wallplay in New York City beginning September 10th. Jennifer Sefa-Boakye for okayafrica, a blog dedicated to bringing you the latest from Africa‘s New Wave. The art of hair braiding has taken centre stage in pop culture in the past few months, from Chris Pratt’s surprisingly good French braiding skills to the return of the braid in Valentino to Vivienne Westwood Fall runway shows. 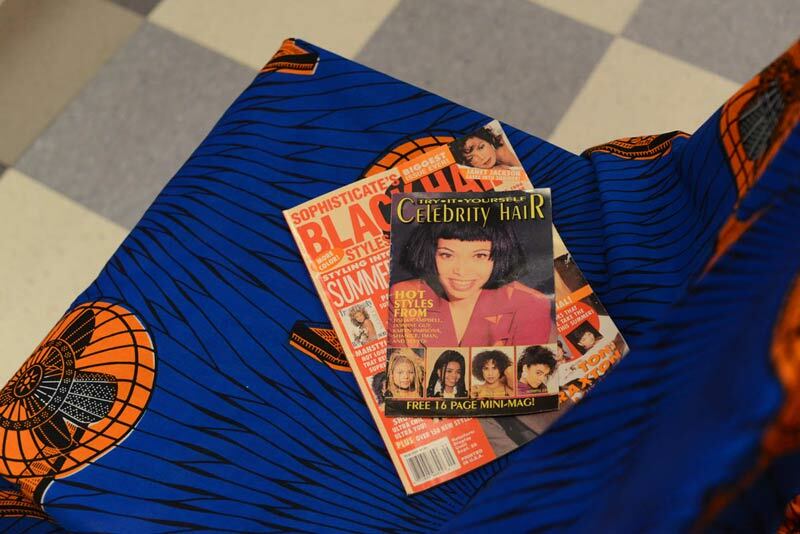 In South Africa, a documentary by blogger Miss Milli B has served as a platform to discuss the politics of black hair in its various styles and textures. Most recently, Hollywood’s new darling Lupita Nyong’o highlighted hair braiding as a cultural practice in a video for Vogue. Shot in a salon in New York, we see Lupita showing off her braiding skills on her friends’ hair. She learnt the technique from her aunt when she moved to the United States. She’s been doing their hair for years, and the camaraderie between them is evident. Among Lupita’s group of friends is Nontsikelelo Mutiti, a visual artist whose recent exhibition Ruka (Shona for to braid/to knit/to weave) examines the social function hair braiding has apart from the aesthetic. Mutiti is a Zimbabwean-born artist and educator who works across disciplines – fine art, design and social practice. 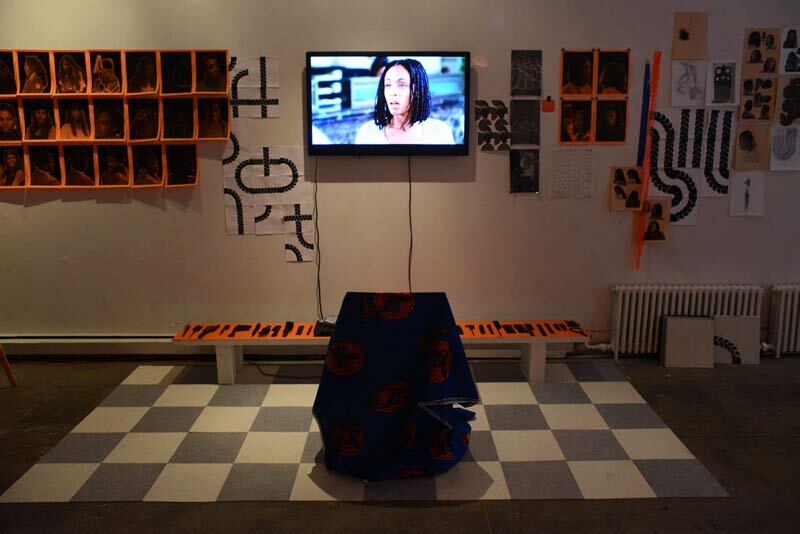 Her Ruka project was exhibited at Recess, a non-profit art space in Soho, New York from June 3rd to August 2nd . It included an installation and an exhibition of hair braiding across traditional and contemporary contexts. I caught up with her recently to discuss the project. What was the source and inspiration for Ruka? I accompanied my cousin to get her hair done one Sunday afternoon in 2010. We went uptown to Harlem, New York. Upon arriving at the braiding salon I was struck at how much it reminded me of hairdressing spaces back home in Harare. The bright walls, loaded conversations, hair dressing posters, the vendors coming in and out selling small items like socks, candy and makeup. It was fascinating for me to realise the way the women working in the space had created a facsimile of something ubiquitous at home. The women working in the salon were not from Zimbabwe; they were form different parts of West Africa. What has been the reception to your work so far in the States, particularly in light of actresses like Lupita Nyong’o promoting the tradition of hair braiding in popular culture? I was glad that Lupita chose to highlight this cultural practice through a platform like Vogue. Giving visibility to the craft and taking ownership of this skill is a powerful statement that assigns value to braiding and braided hairstyles. There was a wonderful sense of community on set. On and off camera we shared personal experiences, advice and memories. It was wonderful to get my hair braided by Lupita. She is very good and I know how long it takes to build up these skills. Braiding is not just about beauty; it is also about perseverance, trust and creativity. It is also such a generous act, spending time with someone, working on them. I hope the audience learnt all these things from the video. These ideas were certainly reinforced for me. What has been the biggest lessons you’ve learnt in the process of connecting with a theme so pertinent to black female identity? When we speak of black female identity we have two important themes pressing up against each other – gender and race. Braiding is a means of adorning the body. Because of my socialisation I tend to imagine it as something associated with women, but looking at a range of cultures we find that people that identify as masculine also wear their hair braided. Whilst discussing braiding and gender during a studio visit, Andrew Dosumno (an acclaimed Nigerian film director), mentioned that there are tribes in Nigeria where men who are involved in certain spiritual practices can wear braids. It has been interesting to do this project at a time when people that identify as black in America are going ‘natural’. Braiding has become a very important grooming choice. There is something that feels akin to the ‘Black is Beautiful’ movement. People are choosing to sign their bodies with an aesthetic that refers to or acknowledges African heritage. My observations have led me to consider how we read images of each other and what it means to emulate or aspire to a particular aesthetic. We are really using hair to mark our bodies and sign specific messages to each other: ‘I am proud of my ancestry’, ‘I will not be defined by western ideals of beauty’, ‘I am cosmopolitan’, ‘I am sophisticated’, ‘I have a range and breadth that goes beyond my traditional culture’. In the context of my home, Zimbabwe, we use braiding most often to add in new hair colour, texture and artificial length. What has the audience reception been to your exhibition? People coming into the space have really felt like collaborators more than an audience. The project emphasises community engagement and artistic research. People have signed up for braiding workshops led by an invited facilitator. We have all felt empowered by the skills we have learnt. There are some of my older works as well as new sketches and collections of objects like combs, movies, fabrics and books, Nollywood and American movies in the space. The different elements that make up the installation have become wonderful tools for starting extremely meaningful, open conversations. Visitors have been very generous, sharing personal narrative or memories sparked by an object or image in the space. Some people come in and are confused because they think it is a real hair salon. The project is playing with the boundaries between a few things. It is a salon and classroom and art studio, film screening room all at once. In essence that is what an African hair braiding salon is. Will the exhibition be travelling to parts of Africa? How much more or less do you think it will it resonate with the audience here? Doing this work in different communities is very important to me because I am not just making artwork; I am learning and sometimes teaching and sharing. I am sure the project will look and feel different depending on each iteration.The community have a big role in shaping what I make and get out of the experience. Because braiding has different connotations in different communities I am sure the work will read differently in different spaces. A range of interpretations makes for an even richer body of source material for continued research and art. Have you found inspiration for your next exhibition? The braiding project is ongoing. I am looking forward to starting a related publishing project and continuing to make new artworks based on different braiding patterns. I am also thinking of creating a dedicated space for continued practice and research around this craft. I am developing a new series of video works titled Black Hair Aesthetic Study with my collaborator Shani Peters. Jeanine Meyer, a colleague from Purchase College, is assisting me with coding online tools to teach a wider engage a wider audience in thinking and learning about the practice and cultural significance of braiding. One project I am looking forward to is inspired by Dutch wax fabrics, another is about names. My goal is to make work that can live in the world. It is wonderful to have institutional support for this type of work because it is not easy to fit all projects within a traditional gallery or museum setting. I look forward to other opportunities to share my work with people in formal and informal settings. Last Tuesday night, Nairobi held its first major, international commercial auction of East African art. The auction, organised by the Circle Art Agency, featured 47 works from 43 artists from six countries spanning the last four decades. In terms of sales, it was a huge success, with 90% of the works going for a combined Ksh18.5-million ($216 000). But in a region long ignored by serious art collectors, and in a city that has mainly catered to foreign art buyers, the auction’s biggest achievement was that over half the works sold to Kenyans. Though that fact is partly a symptom of the ‘Africa Rising’ story of growing middle classes, it also marks an arrival for an unlikely city that has forged a unique modern art history. On the surface, Nairobi is perhaps a surprising art centre as it has little or no art infrastructure. The city has no renowned university art programmes and only two professional galleries, both of which operate in private homes to stay afloat and take tiny percentages so they can keep on board artists who would otherwise sell from their own studios. Kenya more broadly has no art education in government schools or significant public art installations. And beyond a few graffiti artists and political cartoonists, visual art is not on most Kenyans’ radar. 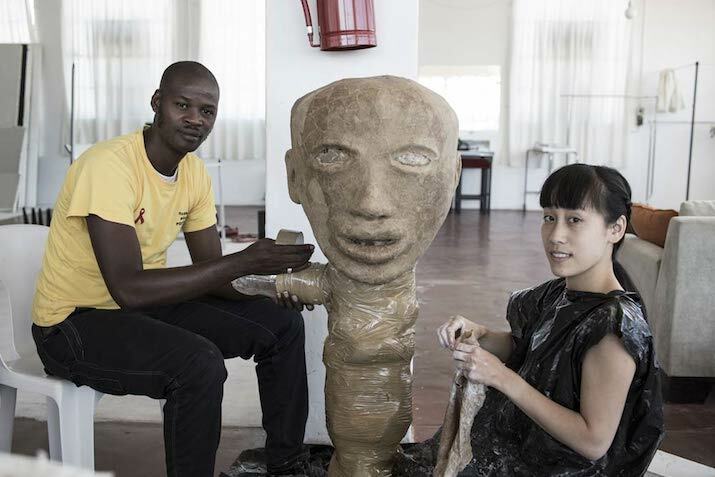 The government is so out of touch with local art that it sent Chinese artists to this year’s Venice Biennial to fill the Kenya pavilion. Yet behind the scenes, Nairobi’s art scene hums with improvised vibrancy. In slums, self-taught artists work in collectives where artists sleep, eat, and create together, pooling profits under the tutelage of an established name. More successful artists share shipping containers as studios. There are showings every week in galleries, private homes, restaurants, and cultural centres, and studios are gathering places for artists, buyers, and hangers-on. 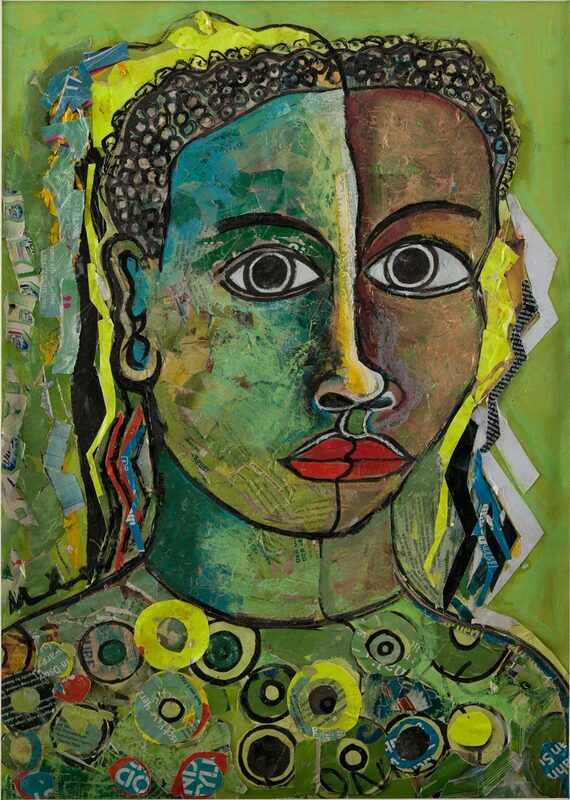 But without a base of buyers who grew up learning about and viewing fine art, groups such as Circle Art have had to be creative in educating and building a market of locals willing to invest in Kenyan art. 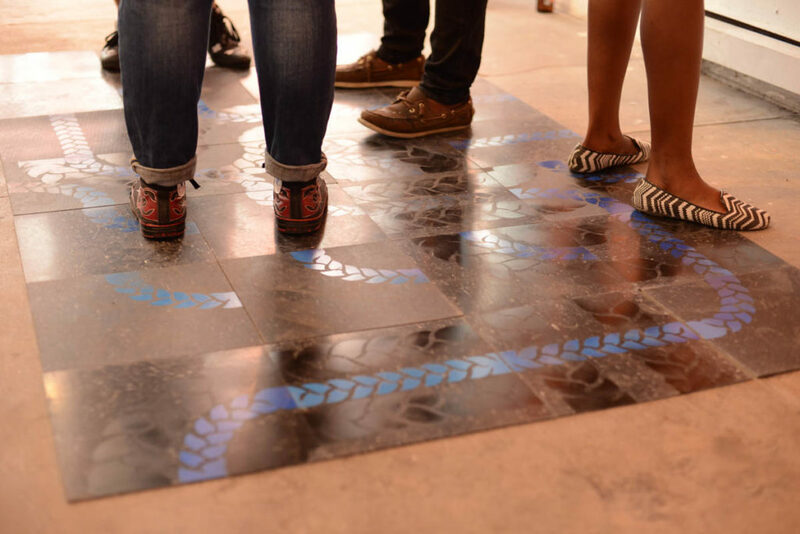 Circle Art gives city art tours to galleries and collectives, and hosts collectors clubs to teach interested Kenyans about the history of local artists. There are ‘M/eat The Artist’ dinner parties in private homes where artists show and sell their work, and most studios are available for walk-ins whereby people can watch the artists in action and buy directly from the source. 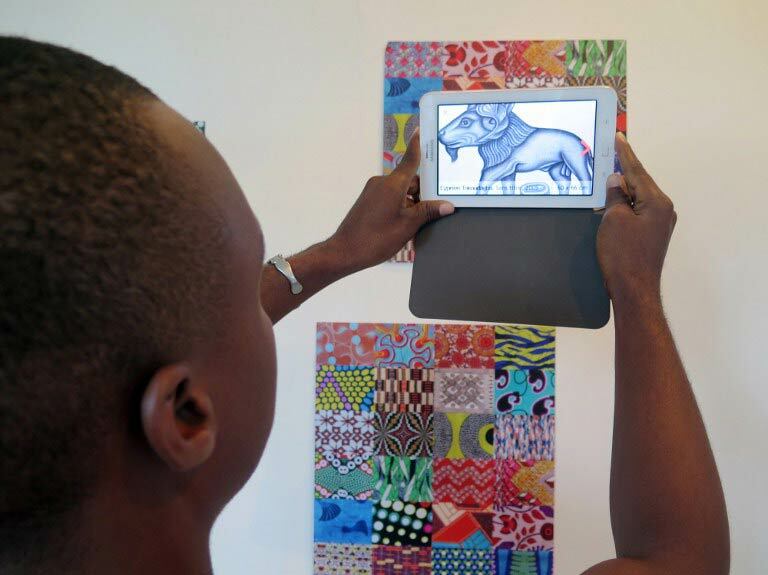 In Nairobi, art is interactive. Soudan, who was featured in the London’s 1:54 fair of contemporary African art last month, weaves human figures using metal wires from tyres burnt in riots. His home is a mini hub for local artists, and within walking distance are two other slum collectives. At one, artists weld scrap metal into sculptures and paint dreamscapes on Chinese-made plastic Muslim prayer mats. Artist Paul Onditi, whose painting Half Life sold at Tuesday’s auction for Ksh704 400 ($8 200) says the fact that these many artists have little training means they make better art. “Here is a place you get self-taughts and they gamble around,” he says. Onditi is actually one of the few here who has received some formal training, but like his fellow local artists loves to experiment, making paintings by a long process of printing digital pictures and transferring them, through a four step chemical procedure he developed, to antiquated plastic printing press boards that he covers with oil paints. Kenya has long been known for its untrained but exciting artists. The ‘naïve’ movement, so called because the untutored artists never studied things like perspective or art history, dominated Nairobi’s scene for decades. 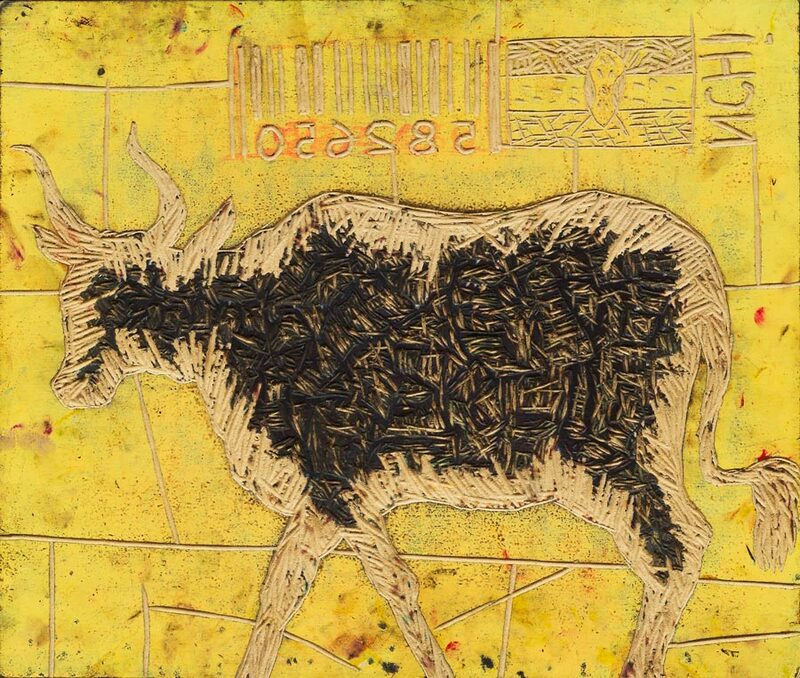 Artists such as Sane Wadu, Wanyu Brush, and Jak Katarikawe painted surreal scenes of animals and rural life with expressive colours, and were marketed to foreign buyers as ‘untouched’ modern African artists. These artists are still revered in Kenya and internationally – a six-panel painting by Wadu sold for Ksh1.5-million ($17 000) on Tuesday – but in the last decade, a new group of contemporary artists have become the big names in Nairobi. This second generation – of Onditi, Soudan, and others – is often just as untrained, but is connected through the internet to global conceptual trends. Notably, these younger artists are more eager to take on political issues now that Kenya’s public space is freer under multi-party democracy. Nchi 1 Barcode, for example, a woodblock by Peterson Kamwathi that auctioned for Ksh375 680 ($4,400), shows the Kenyan flag next to a barcode, questioning the country’s nationhood. 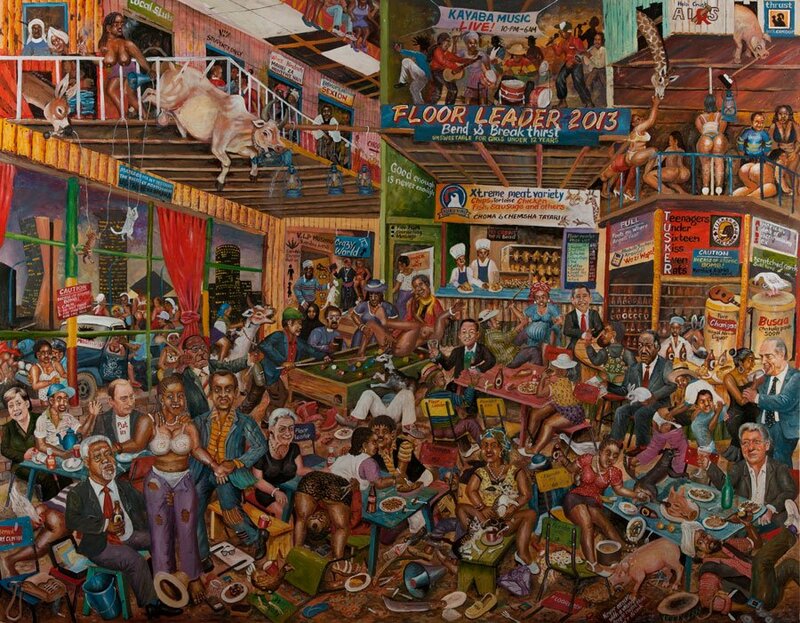 Joseph Bertiers, a former painter of homemade signs, makes Bruegel-esque paintings of partying politicians, one of which, The World’s Craziest Bar, sold for Ksh821 800 ($9 600) on Tuesday. 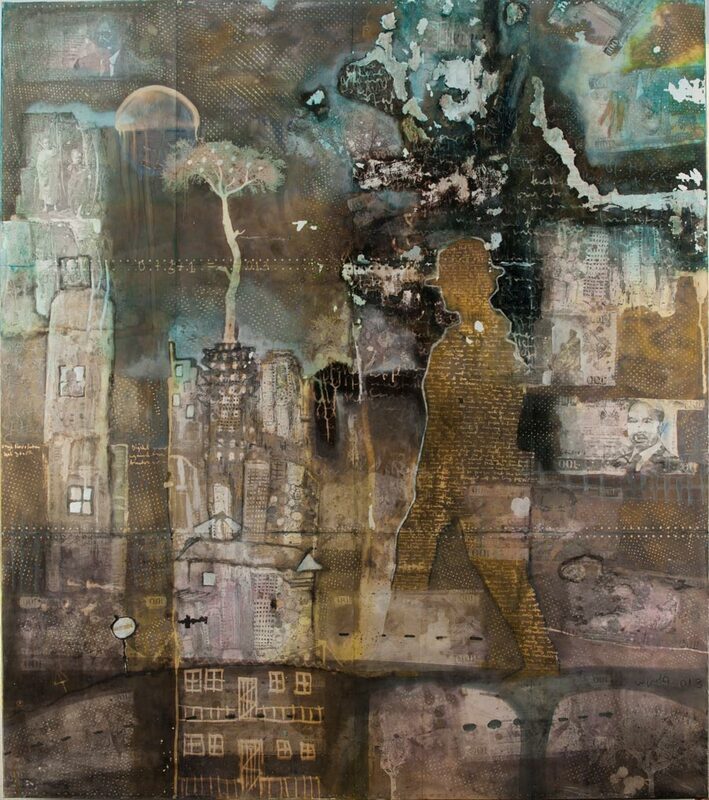 Onditi’s paintings show Nairobi’s congested slums superimposed on slave ships, while Soudan’s sculptures are made literally from the ashes of political violence. Even Wanyu Brush, an old master known for delicate paintings of safari animals and village folk, has moved to tougher subjects and styles in the last few years, with dark lines, jagged brushstrokes, and starker colours seen in his epic Never, Never, Never Again, painted in the wake of Kenya’s 2007/8 post-election violence. “What you are your seeing right now is Nairobi being activated,” says Soudan. Still, many Kenyan buyers avoid such cutting edge, confrontational works, preferring decorative pieces instead. Artist Beatrice Wanjiku, for example, who paints distorted human forms and anguished mouths, was not featured in the auction, while a piece by Richard Kimathi, who paints unsettling blue portraits of child soldiers and gaunt animals, was one of the few under the hammer that did not sell on Tuesday. It will be fascinating to watch where the new attention pushes Nairobi next. Is there momentum to develop more traditional galleries, or will the city continue with self-taught artists and an informal flair? However things progress, what’s clear is that Nairobi has some very high calibre art, and Nairobians are noticing. Jason Patinkin for Think Africa Press, where this piece was first published.